Home > Tiles > Metallic Mini Tiles..3/8"
3/8" square (1/8" thick) mini metallic glass mosaic tiles with either gold/copper streaking or an iridescent finish. Assorted Metallic Mini Tiles..3/8" Metallic Mini Tiles..Black..3/8" Metallic Mini Tiles..Iridescent Black..3/8"
An assortment of all of our metallic minis. Approx 330 tiles in 8 oz bag.Tiles are loose, no soaking off mounting paper or removing from mesh. Shiny slightly iridescent solid color black glass. Shiny iridescent solid color black glass. Metallic Mini Tiles..Grey..3/8" Metallic Mini Tiles..White..3/8" Metallic Mini Tiles..Off-White..3/8"
Shiny grey glass with gold/copper streaks. Shiny iridescent solid color opaque white glass. Shiny cream colored glass with gold/copper streaks. Metallic Mini Tiles..Pink..3/8" Metallic Mini Tiles..Sand..3/8" Metallic Mini Tiles..Butterscotch..3/8"
Shiny pink glass, some transparency. Not for fusing. No exchanges, no returns. Shiny iridescent solid color opaque glass. Shiny solid color opaque glass. Metallic Mini Tiles..Red..3/8" Metallic Mini Tiles..Orange..3/8" Metallic Mini Tiles..Gold..3/8"
Shiny gold colored glass with gold/copper streaks. Some transparency. Square 3/8" tiles (10 x 10 x 3mm). Metallic Mini Tiles..Peach..3/8" Metallic Mini Tiles..Bronze..3/8" Metallic Mini Tiles..Amber..3/8"
Shiny opaque colored glass with gold/copper streaks. Shiny dark bronze colored glass with gold/copper streaks. Shiny amber colored glass with gold/copper streaks. Metallic Mini Tiles..Cinnamon..3/8" Metallic Mini Tiles..Aqua..3/8" Metallic Mini Tiles..Light Aqua..3/8"
Shiny red-brown colored glass with gold/copper streaks. Shiny aqua colored glass with gold/copper streaks. Shiny light aqua colored glass with gold/copper streaks. Metallic Mini Tiles..Mint..3/8" Metallic Mini Tiles..Spring Green..3/8" Metallic Mini Tiles..Lime..3/8"
Shiny lime colored glass with gold/copper streaks. Metallic Mini Tiles..Light Green..3/8" Metallic Mini Tiles..Green..3/8" Metallic Mini Tiles..Shamrock..3/8"
Shiny colored glass with gold/copper streaks. Shiny green colored glass with gold/copper streaks. 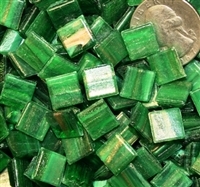 Shiny metallic green opaque colored glass. Metallic Mini Tiles..Lavender..3/8" Metallic Mini Tiles..Turquoise..3/8" Metallic Mini Tiles..Cyan..3/8"
Metallic Mini Tiles..Light Blue..3/8" Metallic Mini Tiles..Blue..3/8" Metallic Mini Tiles..Dark Blue..3/8"
Shiny light blue colored glass with gold/copper streaks. Shiny dark blue colored glass with gold/copper streaks. Metallic Mini Tiles..Dark Blue-Gold..3/8" Metallic Mini Tiles..Cerulean..3/8"
Shiny transparent blue colored glass with gold/copper streaks.